HP Designjet 510 Formatter Board. Is your plotter worth repairing? It is easy and risk free. This sale requires the return of your defective part. An invoice for the CORE DEPOSIT will be emailed to your registered. Will this part fix my plotter? If you are getting a hp designjet 510 error 05 10 or 05:10 Error Code. You Must Replace Your Formatter Board. A 05:10 error on the front panel of the printer indicates a formatter card failure. 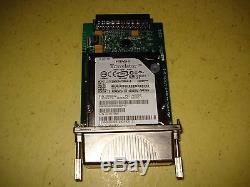 This issue usually does not require on-site service, as the formatter card is a user-replaceable part. I even have a YouTube video showing how easy it is to replace. What is the right part number? HP revs up part numbers with new lots produced. Do you have any feedback? Go to YouTube channel FixYourDesignjet. 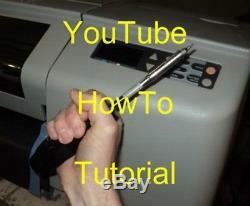 To see all the tutorial videos I have available to learn how to fix your designjet printer. Feedback from satisfied customers: Julie on June 30 2017 Needed a new DesignJet 510 Formatter Board for our office. Received the new board very quickly with a box to return the old one. Worked wonderfully for just about a year but unfortunately had a problem. Received the new board within days and we are back up and running. Thank you to Tom and Designjetpartsfast. Jim on June 10 2017 everything went smoothly, a couple questions answered and its back up and running thanks Jason on Feb 9 2017 Tom was referred to me by a plotter repair guy in Alabama I've known for years and true to his word Tom was very helpful in assuring me that the problem I was having with a customers HP800 was indeed a formatter board. Thanks Thomas on Feb 8 2017 We had a complicated problem with a wide carriage HP DesignJet printer. The repair was extremely difficult to diagnose. Turns out it needed 2 parts and also had a broken trailing cable guide three issues in total. 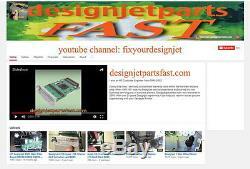 We found Tom Bush and DesignJet Parts Fast by doing a search for how to repair the HP DesignJet on You Tube. Tom was able to provide us with the parts for less cost than our repair guys (parts) estimate. We then could use our IT guy to install the parts using Toms informative repair videos. Further, Tom made himself available to us to assist with any repair-related questions that were not addressed in the videos. The parts were new (not refurbished), genuine HP, and in HP factory-sealed cartons. Tom promptly followed-up with tracking and other information and questions that we had. And here is what further separates Tom from the field: post-sale / post-repair Tom reached out to us to see how our repair went and how the plotter was performing. Tom had already made the parts sale and there was no motivation for any further follow-up at this point, yet he did. This is the very essence of superior service. Colin on September 24 2015 Tom was a huge help. I reached out to Tom for help due to the 05:10 error and he told me to replace the formatter board. Thank you very much Tom! Mircea on September 02 2015 Good price, quick service, great support. Tom was very knowledgeable and helpful in identifying the problem and recommending the correct solution. The board worked perfectly and our plotter was back in business in the minute following the card installation. This is definitely the first place Ill call in the future for any problem with HP devices Sharon on August 17 2015 Tom was awesome! We needed this part right away and he went out of his way to help. Also, gave us tips as to why our cards kept getting ruined. I would definitely deal with Tom again. Thank you for having the right parts at a reasonable price. Ronald on August 14 2015 Finding the part for my hp designjet 500 was very easy to find on your site, Talking with Tom showed me what an expert he is in this field. I have already recommended you to to my friends who can do with your service. True on April 17 2015 Tom was very helpful and worked with me to see if I would be able to put an HP-GL/2 into my HP Designjet 500 that didnt have one installed. He sent it to me to see if it would work and it worked flawlessly allowing me to print from a couple of our computers that havent been able to send a print to our plotter for years. Will definitely come back for any future needs. B Bouapha on April 07 2015 Tom was very accommodating in rushing our urgent need for our parts. We didnt need everything and he did not have a problem accepting our return. He is ALWAYS available and in this industry, Im pretty sure everyone agrees that we all need HELP ASAP!! What more can you ask for! Will reach out to Tom for future designjet plotter issues. N Enloe on March 21 2015 Quick service, excellent follow up, card worked first time we powered up. Ryan on March 11 2015 Tom is a super nice guy and easy to deal with. He explained everything to me with patience and went out of his way to accommodate our need to have the 510 GL/2 card sent to me UPS Next Day! Dont know if the printer is fixed yet because I just ordered the part 5 minutes ago, but I will keep my fingers crossed. Either way, Tom was great! The item "C7779-60272 DesignJet 800PS Formatter Board with Hard Drive ONE YEAR WARRANTY" is in sale since Wednesday, May 29, 2013. This item is in the category "Business & Industrial\Printing & Graphic Arts\Plotters & Wide Format Printers". The seller is "tabcom" and is located in Fort Wayne, Indiana. This item can be shipped to United States.